Conor O Brien’s involvement with the 1914 Gun Running to Howth and Kilcoole on behalf of the Irish Volunteers stemmed from a fusion of his sailing and political enthusiasms. In 1910, he had become the owner of the Kelpie, a veteran 26-ton cutter of 1871- vintage which he converted to ketch rig and in 1911 sailed round Ireland. In addition to cruising he used the boat as a base for expeditions to coastal mountains, a typical episode occurring in 1913 when he anchored Kelpie in Brandon Bay for a week and explored Mount Brandon with the noted climbers George Mallory and Winthrop Young. O’Brien’s friendships through offshore sailing were equally distinguished , as his fellow enthusiasts included Erskine Childers and Gordon Shephard, both of whom were already legends in the challenging world of small boat cruising. They also shared his increasingly passionate belief in a measure of Home Rule for Ireland, and all were actively involved in the Gun Running of 1914. This stemmed from events in late 1913, when the majority movement towards Home Rule was intensifying, but so too was opposition, particularly in the north of Ireland. What had been a matter of debate threatened to become some sort of civil war, so on 4th December 1913 the Government in London issued a proclamation forbidding the import pf any arms into Ireland. In defiance of this, on the 24th April 1914 the Ulster Volunteers, formed to oppose Home Rule, illegally landed some 20,000 rifles and more than three million rounds of ammunition at Larne in County Antrim from the steamship Clyde Valley. Until then, the Irish Volunteers had been notably law-abiding in their efforts for Home-Rule, but it soon became obvious that some significant gesture in retaliation was required to stiffen morale. Government patrols to prevent gun-running had been stepped up, which made the use of ships of fishing boats impossible. So Childers with his 28ton Ketch Asgard and O’Brien Kelpie arranged to collect a small but symbolically significant cargo of 1,500 ancient rifles at a meeting point at the Ruytigen Lightship off the Belgian Coast for eventual landing somewhere in Ireland. 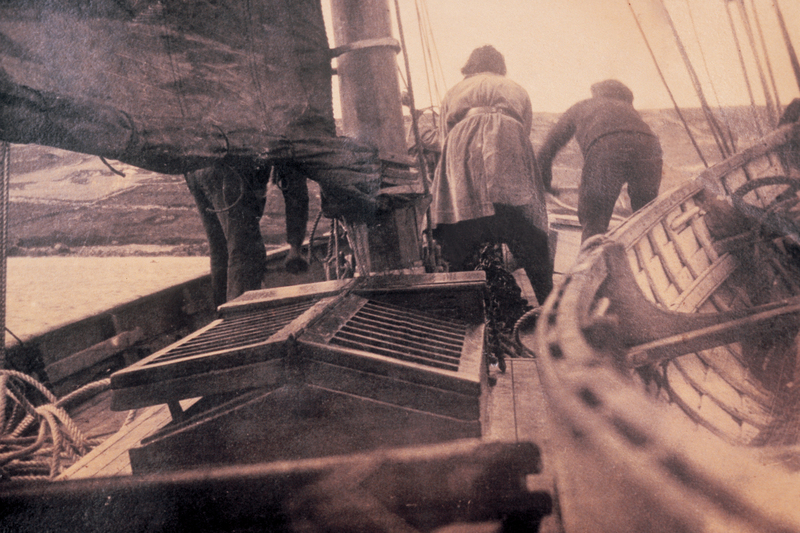 As Childers’ crew included his seafaring wife Molly, the highly-experienced Gordon Shephard, and O’Brien’s cousin Mary Spring Rice, who was likewise an experienced sailor, the Asgard was able to make splendidly dramatic and effective gesture of sweeping into the harbour of Howth immediately northeast of Dublin in broad daylight on Sunday July 26th 1914, when 900 guns were unloaded with the help of the Volunteers in just 45 minutes. A more complex plan had been evolved for O’Brien’s cargo on Kelpie. Another leading Home Rule enthusiast with an interest in sailing was limerick-born Sir Thomas Myles, who was an eminent surgeon in Dublin. His yacht the Chotah had an auxiliary engine, which permitted easier manoeuvring in remote places. So the guns were transferred from Kelpie to Chotah at a hidden anchorage off the Welsh coast, and on the night of Saturday 1st August 1914 they were successfully landed on the isolated beach at Kilcoole on Wicklow coast. However, within a week, global events took over. The Great War broke out, and all the leading participants in the Gun Running joined the British forces, partly in the belief that they were fighting for the rights of small nations like Ireland. Childers became a highly decorated Lt. Commander in the Royal Navy, and went on to a notable naval flying career. Shephard became the youngest brigadier in the British Army, and died on active service with the Royal Flying Corps in 1917. Myles joined the Royal Army Medical Corps, and rose to the rank of Colonel. And O’Brien soon found his niche in the Royal Naval Volunteer Reserve and served with distinction for the duration. By the time that duration was completed in 1918, Ireland was in turmoil. In the post Treaty Civil War, Erskine Childers opposed the Treaty and was executed by Free State forces in November 1922. Meanwhile Conor O’Brien, less extreme in his views than Childers, had served the new Irish Government as a Fisheries Inspector, using Kelpie to cover the West Coast in the course of his work. He took a break a break in 1921 to cruise to Skye on the Scottish West for some mountaineering. Returning single-handed through the North Channel in September 1921, he over-slept while cat-napping and Kelpie came ashore on the Galloway coast in southwest Scotland. Conditions were gentle, yet the old boat was soon a total loss. It was traumatic experience. But it cleared the way for Conor to design and build his dream-ship for the voyage of his life.